“Lefty” changes putting grip styles like a Hollywood heartthrob changes girlfriends. We’ll discuss his various flirtations in a moment. 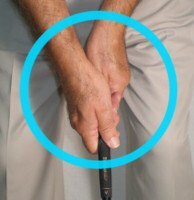 But first let’s look at Phil Mickelson grip for regular golf shots. For all his tinkering with putting methods and Changing clubs within his set, Phil Mickelson has stuck with pretty much the same grip over the years. Like the majority of pros, he favors the overlapping style. His hands are rotated a touch to the left on the handle, which is a slightly strong position for a southpaw. This grip allows Mickelson to swing freely, with plenty of wrist hinge, but it’s not so strong that he has to constantly fight off a hook. On the greens, we find the five-time major champion in experimental mode. Mickelson has favored a conventional, reverse-overlap putting grip through most of his career. He first tried the Claw grip (aka the “saw” grip), popularized by Chris DiMarco, in 2012, and alternated between styles in the following years. Phil Mickelson grip – the claw, that is – finds the right hand grasping the top of the club, his thumb extended down the shaft. 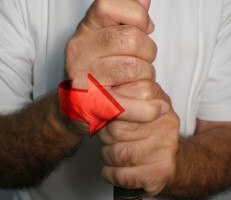 With his left hand separated from the right, he cradles the handle lightly between the thumb, index and middle fingers. Mickelson believes the claw improves his touch and speed on extra-fast greens. 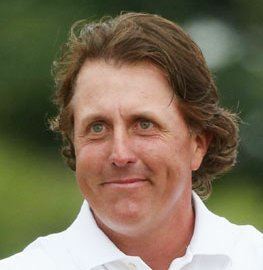 What will Phil do next? That’s anybody’s guess. The only certainty is, it won’t be the same ol’, same ol’.